I came across a lovely new review today for SINCE ALL IS PASSING. The review is on Goodreads, and is written by Sue1958. Please check it out, and if you’re so inclined, you can “like” the review. 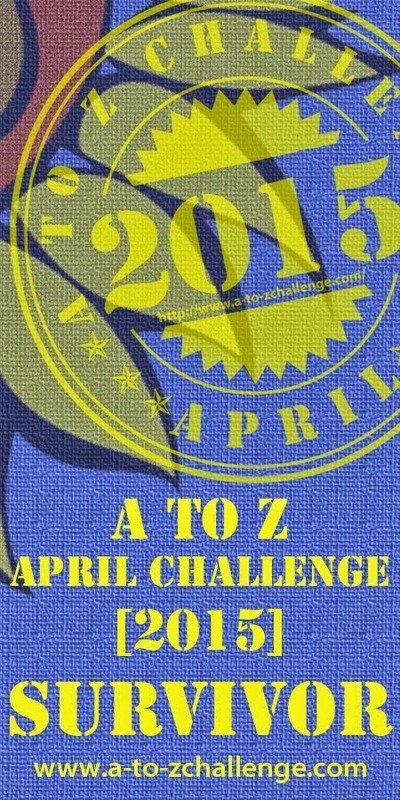 It’s time to reveal my theme for the upcoming A-Z Blog Challenge, which takes place throughout the month of April. I’m a newbie here—my first time doing this--so I’ve looked at lots of other theme announcements on other participants’ pages, and here’s what I’ve come up with. As this is my first time doing the A-Z challenge, I don’t want to bog myself down with too narrow a focus. So since my blog is called, “The World According To Liz,” I’ll use that as my theme. I’ll give you my take on anything that crosses my mind: books, writing, movies, travel, animals, nature, family. And my take tends to be a little skewed, a little off-center. Looking forward to interacting with all of you throughout April. I’ll welcome comments and your thoughts on whatever the daily topic is. And if you have a suggestion for a topic farther down the road…er, down the alphabet…I’d like to hear that also. Let the fun begin! The participants are showcasing just about everything you can think of, from animals and art, to travel and writing. There’s something for everyone! I hope you’ll visit my blog starting on April 1, and stick with me throughout the month. See you there!